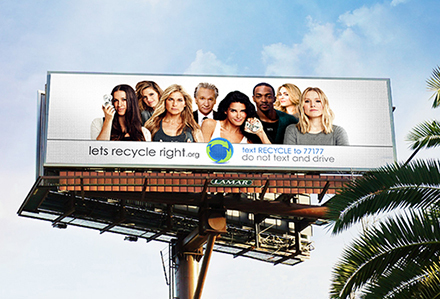 In honor of Earth Week, a photo shoot of celebrities for the ‘Let’s recycle right!’ PSA campaign will be live-streamed from Los Angeles onto hundreds of Lamar digital billboards across the country. LOS ANGELES, CA – April 13, 2016 – Lamar Advertising Company (Nasdaq: LAMR) is proud to announce a partnership with Recycle Across America (RAA), a nonprofit organization that provides standardized recycling bin labels to businesses, municipalities and schools nationwide, to make it easier for society to begin to recycle right. The partnership will create a world’s first with out-of-home advertising. Lamar Advertising is donating the use of hundreds of digital billboards across the country, which will display a celebrity PSA campaign live-streamed from a photo shoot in Los Angeles on April 21st. This first-ever live-stream photo shoot is expected to result in more than three million PSA ad spots across the U.S., promoting Recycle Across America’s Let’s recycle right! campaign. Lamar is providing use of the digital billboards at no cost to RAA during the event on April 21st and the entire Earth Week. This significant donation is valued at over $350,000 in ad contributions for the week. The April 21st evening event called, ‘Let’s pose for progress!’ will be hosted at MILK Studios in Hollywood, CA. Famed celebrity photographer, Timothy White, is donating his talent to conduct the live-stream photo shoot of celebrities who are lending themselves to promote the nonprofit standardized labeling solution for recycling bins, to help recycling and closed loop manufacturing begin to thrive; and to prevent waste from going into oceans. Some of the celebrities that are currently involved in the ‘Let’s’ campaign include: Kristen Bell, Angie Harmon, Bill Maher, Ian Somerhalder, Alanis Morissette, Gabby Reece, Anthony Mackie, Stana Katic, Elvis Nolasco and Josie Maran. 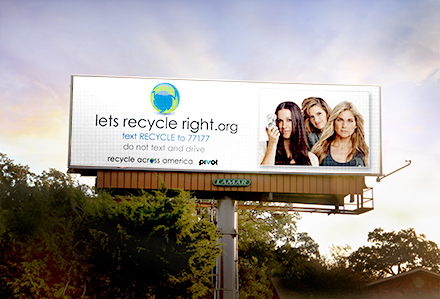 Lamar’s digital billboards will promote Recycle Across America’s Let’s recycle right! campaign for Earth Week. Photos from the ‘Let’s Pose for Progress!’ celebrity PSA photo shoot and event at MILK Studios on April 21 will be live-streamed to Lamar’s digital billboards across the country. To support this, Participant Media’s television network, Pivot, is donating free ad time. Pivot is providing ongoing airtime for RAA’s PSAs and running a Social Action Campaign to help spread the use of RAA’s standardized label solution, which is proven to expedite environmental progress. “Recycle Across America is extremely grateful to Lamar Advertising, Pivot, Timothy White, all of our brand partners and the amazing celebrities involved. Their generosity will help bring this critical PSA campaign and solution to millions of people nationwide, while also making advertising history! The timing of this event is vital as the recycling industry is struggling here in the U.S., indicated by recent mass closings of recycling plants nationwide, including 200 in the state of California alone,” said Executive Director, Mitch Hedlund. At the evening event, RAA will also announce the first state in the U.S. to adopt the standardized labeling system statewide. Therefore, the standardized labels will be displayed on recycling bins throughout the state at residences, government offices, schools, airports, transportation centers, etc. to help people begin to recycle right, wherever they might be. The recycling theme will be carried on throughout the evening. Outdoor gear and lifestyle brand RAREFORM will be repurposing a Lamar billboard vinyl featuring RAA’s Let’s PSA campaign into one-of-a-kind, limited-edition surfboard and duffle bags that will be given to celebrities at the event. The Let’s pose for progress! event is one of two sustainability-focused events held that day. In the morning, the Brand Leaders Solution Summit will be hosted by Pivot and Recycle Across America in conjunction with executive speakers from brands such as Whole Foods Market, Kiehl’s Since 1851, TerraCycle and 1% for the Planet. Why are Standardized Labels so Important? There is a misconception that recycling is collapsing in the U.S. as a result of the low-cost virgin commodity pricing and the trend toward mixed recycling systems. Although those reasons are contributors, they don’t represent the entire truth. Recycling and recycled commodity pricing would be economically viable and able to weather the down-turn of competing virgin commodity pricing, simply by preventing the widespread contamination issue that is causing the processing costs for recycling to be so exorbitant. Everyday millions of tons of garbage are thrown in recycling bins due to public confusion arising from inconsistent recycling labels on recycling bins, making it tremendously expensive to remove the contamination during the recycling process. RAA’s standardized labels for recycling bins are proven to address the contamination problem at the source, helping people recycle right and recycle more. In fact, the standardized labels are proven to increase recycling levels between 50-100%, while significantly reducing the amount of garbage that typically contaminates the recycling bins. In an independent national focus group, testing the efficacy of the standardized labels against other recycling labels, the standardized labels resulted in more recycling, less contamination, less confusion, more appeal and overall better results. With less contamination (aka garbage) thrown in recycling bins each day, recycling and closed-loop manufacturing can begin to thrive. And it is proven, in countries that have strong recycling cultures and efficient systems, fewer materials are littered and less waste goes into oceans. Recycle Across America (RAA) is a 501(c)(3) non-profit organization, that has developed the first and only society-wide standardized labeling system for recycling bins to help eliminate the public confusion surrounding recycling and to improve the economics of closed loop manufacturing. RAA and the standardized labels have been identified as a world-changing solution by Ashoka Global Innovators for the Public and are being referred to as “one of the most important environmental fixes taking root today.” For more information about RAA’s standardized label initiative or its celebrity-led ‘Let’s Recycle Right’ campaign, visit www.recycleacrossamerica.org or contact info@recycleacrossasmerica.org. Founded in 1902, Lamar Advertising Company is one of the largest outdoor advertising companies in North America, with more than 325,000 displays across the United States, Canada and Puerto Rico. Lamar offers advertisers a variety of billboard, interstate logo and transit advertising formats, helping both local businesses and national brands reach broad audiences every day. In addition to its more traditional out-of-home inventory, Lamar is proud to offer its customers the largest network of digital billboards in the United States with over 2,400 displays. Please feel free to explore our website www.lamar.com or contact pr@lamar.com for more information. Lamar Advertising and Posterscope USA have unveiled a new outdoor campaign for the 2016 Chevrolet Malibu launch using vehicle recognition technology that can identify certain types of vehicles and generate dynamic, customized messages to drivers of those vehicles on digital billboards.